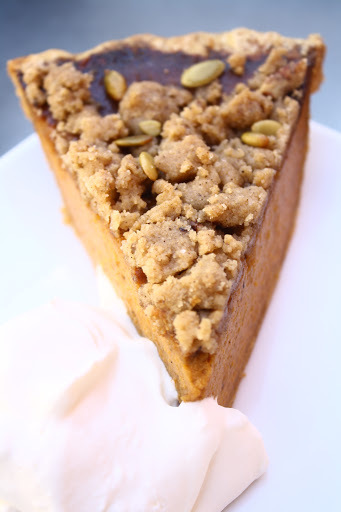 The Sycamore Kitchen’s seasonal offerings include this pumpkin pie with crumble topping and a dollop of freshly whipped cream. As a food blogger, people often ask me about my favorite bakeries in Los Angeles. With so many wonderful bakeries each with its distinct style, it can be difficult to select a single one. The Sycamore Kitchen strikes the ideal balance between European-style patisserie and cozy American bakeshop. Husband and wife team Quinn and Karen Hatfield, chef-owners of Hatfield’s restaurant, founded Sycamore in the summer of 2012 with the goal of “redefining the urban bakery.” The building’s rustic design of red brick walls, industrial windows, and glossy wood tables contributes to its unique aesthetic. The menu includes American treats we know and love, such as chocolate chip cookies, buttermilk scones, and coffee cake, but with a refined finish. The chocolate chip cookies use rye flour instead of traditional all-purpose for an earthy flavor, sour cherries add vibrance to the buttermilk scones, and crème fraiche moistens the coffee cake. The Hatfields use only the highest quality, seasonal ingredients, and offer breakfast and lunch items in addition to sweets. I recommend the Cinnamon Brioche French Toast, the Mediterranean Chicken Salad, and the Farmhouse Chop Salad. For dessert, you must try the Salted Caramel Pecan Babka, a light, buttery pastry wound together by layers of sinful salted caramel. The Sycamore Kitchen also serves excellent coffee, courtesy of Stumptown Coffee Roasters. 143 S. La Brea Ave.
Monday-Sunday, 8 a.m. – 5 p.m.